Cllr. Elliot Sigasa, who was appointed the Mayor of Mafube Local Municipality in October 2012. He was born on 08 October 1970 at Ntswanatsatsi Cornelia in the Free State. He undergone his primary education at Ntswanatsatsi Primary School until 1986 and went to Falesizwe Secondary School in Namahadi Frankfort from 1987 to 1990 where he obtained his matric. He joined the ANC in 1990 after the unbanning and was the first Mayor of Cornelia TLC in 1995 to 1999. He is also a Councillor in ward 4. He was re-elected as a Councillor during the amalgamation of municipalities in 2000 and then elected as an EXCO member in the Council until October 2012. 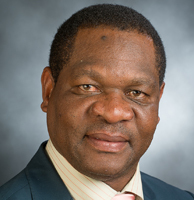 He became the Chief Whip of the ANC (ruling party) from 2002 until October 2012. Sigasa was appointed as a Party Liaison Officer for the (IEC) for the ANC since 2004 till to date. He was subsequently appointed as the local election co-coordinator of the ANC from 2011 to date. He is currently a representative of Mafube Local Municipality and was seconded to Fezile Dabi District Municipality for two terms. He became the chairperson of the African National Congress Youth League in Cornelia from 1992 to 1995. He is the currently the chairperson of the Community Policing Forum. He was elected the branch chairperson from 2000 to date. He was subsequently elected as a Regional Executive Committee member during the Fezile Dabi ANC elective conference in 2012, a structure that he still serves in.